Purdue Pharma will pay $270 million to settle Oklahoma’s claims that illegal marketing of Oxycontin devastated local communities, the first accord in a wave of lawsuits faced by the drugmaker. Three dozen states and 1,600 U.S. cities and counties have similar suits pending against Purdue and two other opioid makers. Now that Parliament has seized control of Brexit from Prime Minister Theresa May, it will vote on alternatives to her deal Wednesday. Carlos Ghosn received an unusual perk during his time at Nissan. The company paid for all four of his children to attend Stanford University. The world's cheapest hospital charges just $700 for cancer surgery. Pretty good, but under India's new health-care system, Bloomberg Businessweek reports, that's not good enough. McDonald's is spending more than $300 million on a decision-logic tech company. The acquisition will allow the fast-food chain to vary digital menus depending on weather, time of day or regional preferences. Following a Bloomberg Businessweek report, Lloyd's of London outlined a plan to address allegations of sexual misconduct. Just three years after the landmark Paris agreement, carbon emissions hit a record high last year after energy demand grew the most in a decade. What’s Joe Weisenthal thinking about? The Bloomberg news director is unpacking yesterday's Apple rollout. Investors were underwhelmed by the new services the company introduced as shares fell 1.2 percent. But the bigger picture is that all of the internet giants appear to be setting up for a new battle, one where they try to block each other out. An Australian anti-Muslim party was taped seeking NRA cash. Airlines with electric engines are coming in 2021. Mike Pence wants to return astronauts to the Moon within five years. Lawmakers want an outside review of the 737 Max fixes. Trump's tweet on North Korea sanctions was intended to be policy. A judge says some Apple phones should be banned from the U.S. The rally in U.S. stocks faded on Tuesday. Extreme weather events are getting worse, and so is their impact on coastal real estate. But even as coastal housing becomes more vulnerable, the cost of living there has stayed relatively stable, and home prices continue to rise. 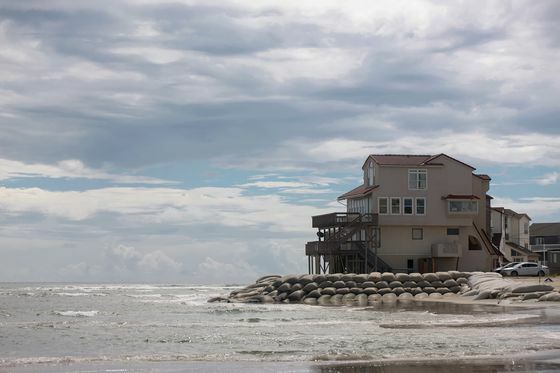 It’s not that homebuyers are ignoring the growing threat of climate-related damage; it’s just that there are too few financial repercussions for coastal homeowners.